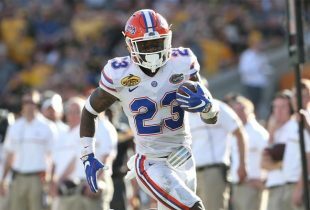 From the moment his Pro Football Hall of Fame speech concluded Saturday night, speculation surrounded running back Emmitt Smith’s omission of the Florida Gators when discussing his career and progression to the NFL. Did he purposely snub the University of Florida, or did he accidentally forget to mention them due to the emotion and importance of the evening? Thanks for all of the good wishes about the Hall of Fame…need to say a special hello to my Gator Nation. I sincerely, sincerely apologize for not mentioning you last night in my Hall of Fame speech, Gator Nation. I just got caught up in everything. Pleaase charge it to my mind, not my heart! Once a Gator always a Gator. I loved everything the University of Florida gave me. Smith concluded his interview segment with a Gator Chomp. So, is everybody happy now? There was no need for you to apolagize Emmit. Emmitt is a great Gator and we need to give him a break! Whatever! I don’t believe that…how can you forget UF and he even came back to finish his career. Judy…..you are insane. He lacks character?! Did you even hear his speech?! Far and away the best HOF speech I’ve ever heard. Emmitt oozes character, integrity and class. And you are saying all of those hateful things because he didn’t mention the Gators? Who cares, he’s in the HOF because of what he did in Dallas. And if you saw his Homecoming special, he did the Gator chomp and mentioned UF several times. Plus he did it tonight at the HOF game and on Twitter. Give the guy a break. He’s a class act, a legend and a man of integrity. Show some respect. i accept his apology. he did great stuff for us. and hes a gator great. at least he apologized to us. emmitt you rock. and go gators. Does anyone remember seeing film of Emmitt playing for UF during Jerry Jones introduction or any of the HOF program? Still think the omission was a mistake? Knight- Didn’t have to post the comment three times. No, didn’t see any video of him at UF…but it was his Pro Football induction, not college. Gator Nation sure got a lot more attention (and Emmitt love) with his omission and subsequent apology……………..